Caption - South African Railways (SAR) two-foot gauge NGG16 class Garratt no.116 is seen at Harding loco shed in May 1983. 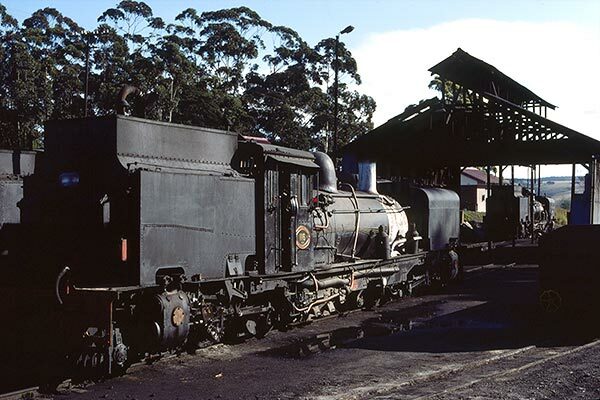 At the time of the visit there were four other Garratts on shed being used for trains down towards Port Shepstone. SAR closed the 122 km line in 1986 with operations taken over by the Alfred County Railway until they went bankrupt in 2004. These 'baby' Garratts were wonderful machines and this loco was one of a batch of eight NGG16's produced in 1939 by Beyer Peacock in the UK.